A new technology suitable for practical clinical testing can detect KRAS gene mutations in lung and colorectal cancers and could thereby facilitate targeted therapies, according to a new report in The Journal of Molecular Diagnostics. The identification and functional analysis of tumor-specific genetic alterations suggest opportunities to exploit genetic mutations as predictors of therapeutic response and guide a more effective patient treatment regime. KRAS mutations represent a powerful biomarker for predicting treatment sensitivity in patients with non–small-cell lung cancer and colorectal cancer. The protein product of the normal KRAS gene is involved primarily in regulating cell division. Conventional mutation testing technologies are not ideal for routine clinical screening of KRAS mutations because they often involve complex, time-consuming processes and/or costly instrumentation. Investigators have therefore developed and tested a new technique for lung and colorectal cancer samples that can be used in routine testing. 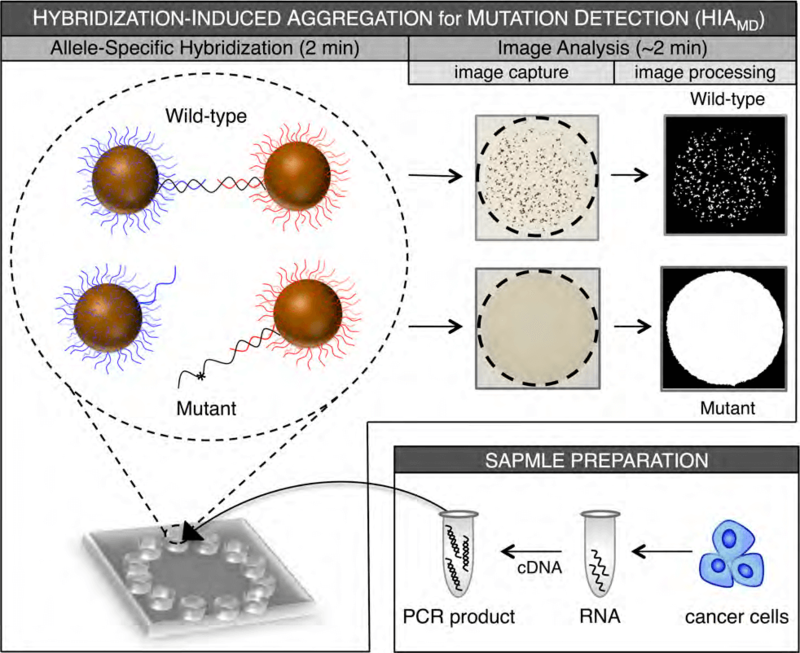 The new technique described in the study uses hybridization-induced aggregation (HIA) technology for mutation detection (HIAMD), which enables the detection of common KRAS mutations in less than 10 minutes following PCR amplification. HIA is a bead-based DNA-detection technology that is scalable for a microchip platform. Assay principles. Unpurified PCR product is added to a microwell containing probe-conjugated microbeads. A wild-type target hybridizes efficiently to both probes, inducing bead aggregation. Hybridization of a mutant target to the discriminating probe is unfavorable; therefore, the beads remain dispersed. An image of each microwell is obtained and processed to generate a saturation value corresponding to the extent of aggregation. The investigators analyzed 20 lung and colorectal tumors and compared the results using this new technique with results from the more expensive and cumbersome sequencing method. The results of KRAS mutation screening using this technique were 100% in agreement with the results derived from sequencing. In addition, a sample with only 25% KRAS mutant content could be detected in a background of wild-type DNA, consistent with the detection limit reported using the sequencing method. “Hybridization-Induced Aggregation Technology for Practical Clinical Testing: KRAS Mutation Detection in Lung and Colorectal Tumors,” by Hillary S. Sloane, James P. Landers, and Kimberly A. Kelly (doi: 10.1016/j.jmoldx.2016.02.004), published online in advance of The Journal of Molecular Diagnostics, Volume 18, Issue 4 (July 2016) published by Elsevier. Supported by NIH NCI Cancer Center support grant P30 CA44579 (University of Virginia Cancer Center). Full text of this study is available to credentialed journalists upon request; contact Eileen Leahy at +1 732 238 3628 or jmdmedia@elsevier.com. Journalists wishing to interview the authors may contact Kimberly A. Kelly at kak3x@virginia.edu.